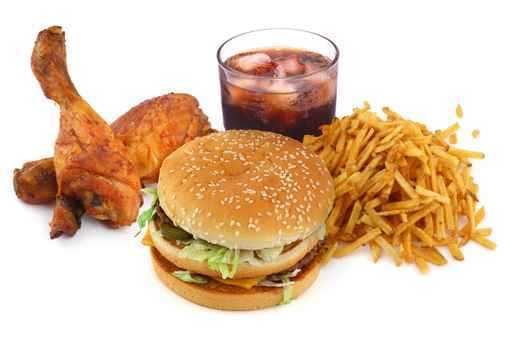 Eating healthy at a fast food restaurant is difficult, but not impossible. Order orange juice or milk instead of soda to boost the vitamin and mineral content of your meal. If you are going to order a soda, order a small soda. It has about 150 fewer calories than the large one. When out for pizza with your friends, order a salad and enjoy it before the pizza comes. This will help to curb your appetite and start your metabolism to burn rather than store it as fat. Ask for sandwiches without special sauce, cheese, dressing, or mayonnaise and eliminate the bun. Order your salads with the dressing on the side. Try ordering something grilled, baked, or roasted not fried. Instead of chicken nuggets try a grilled chicken sandwich without the bun. Order regular portion sizes instead of the jumbo sizes that are now common at most fast food restaurants. Share an entrée with a friend when going to a restaurant. Try a bake potato instead of french fries. Skip the butter and sour cream. Try BBQ sauce instead. Arby’s, Burger King, KFC, Mc Donald’s, Pizza Hut, Subway, Taco Bell, and Wendy’s.